This is a completely healthy snack that tastes so good it will lead you to addiction! And what an addiction: dark greens that you want to eat every day! Kale is a wonderful healthy leaf but I confess I’ve struggled to find great ways to consume it in bulk. 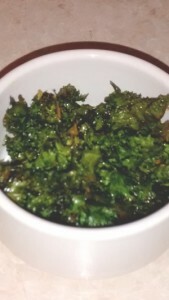 I sometimes steam it with other veggies, but since I discovered this recipe, I found out what Kale was made for – to fill in the gap of crisps in the world of healthy eating! Just try it for yourself. It’s not only a very tasty ‘finger food’ but also incredibly fast and easy to prepare. With this recipe, you can get through a bag of 200g fresh kale in one seating – as a starter! Preheat the oven to 100C. Put the palm oil on to a large baking tray and taw it in the oven until just starting to melt (a few seconds only). If using olive oil, you can skip this step. Place the kale on top of the tray, sprinkle with salt and pepper and then move the leaves around on the greased tray constantly turning them to rub a very light coating of oil all over. It is important to spread the leaves in one layer or they might not crisp up so well. Once leaves are fairly evenly coated, place the tray in the oven for about 10 or 15 minutes. Make sure to remove before leaves start to turn brown. These kale crisps are the easiest way to get through lots of healthy greens. They crisp up so well that they almost disappear on the tongue when crunched down. They are excellent snacks but also good for sprinkling over salads for a bit of texture.